TIGARD — Carter Dennis is looking to make up for lost time. Emilio Jimenez is aiming to stay extremely focused as he takes aim at some lofty goals. And the two Tigard High School seniors took a step toward their aspirations on Thursday. 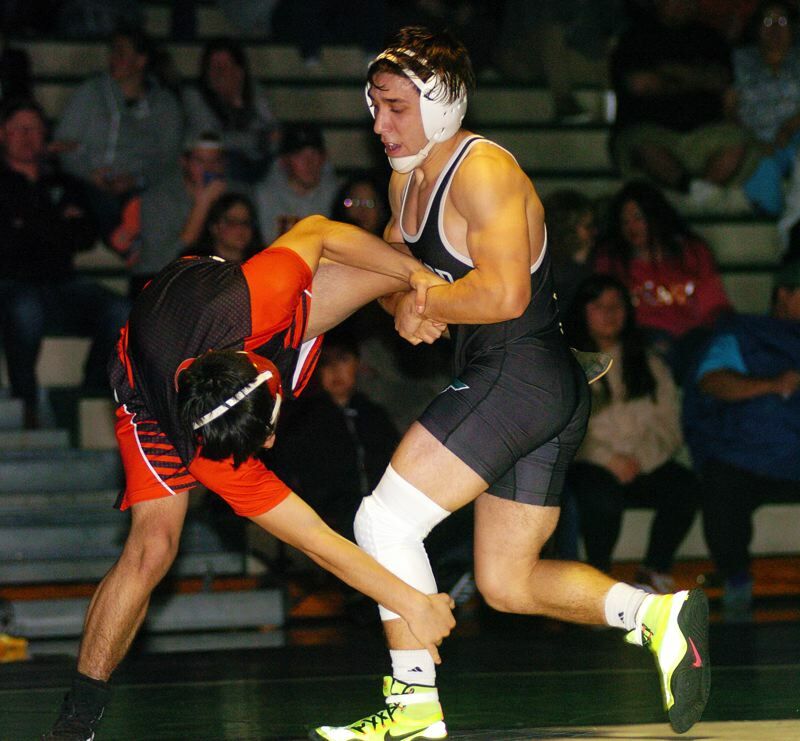 Dennis and Jimenez were both victorious for the Tigard High School wrestling team, when the Tigers took on Oregon City in a Three Rivers League dual match held at Tigard High School. Dennis won by fall in the 220-pound match and Jimenez won by pin at 138 pounds. For Dennis, just getting back on the mat and competing is a victory in its own this year. "I was pretty excited about it," he said after the match. "Unfortunately, I was unable to wrestle my junior year, with a knee injury, which was pretty disappointing. Especially since I came pretty close to placing my sophomore year, so it was really fun to get back out on the mat." It's also a big year for Jimenez, who is in his fourth year wrestling in the Tiger varsity lineup. "It's my senior year, and I'm ready to go," he said. "This feels real good, getting out here in my last year, and putting on a show for the crowd." 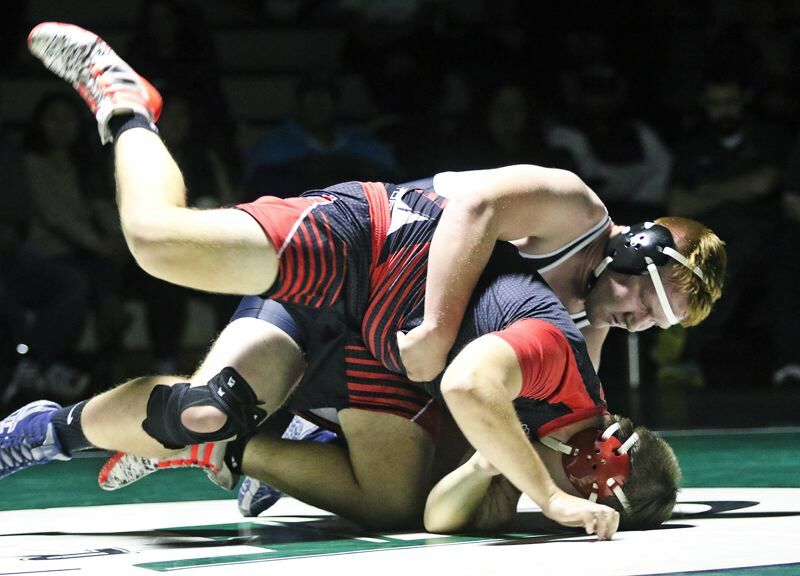 Despite the victories by Dennis and Jimenez, Tigard fell 45-27 to Oregon City. With the victory, the Pioneers moved to 1-1 in league dual matches, while the Tigers are also now 1-1 in TRL matches. "Looking at the score, that hurt us," Jimenez said. "We came in here, thinking we were going to win, but we just have to get back in the room and work harder. That's all we have to do right now." "This team was better than Canby (who Tigard bested 43-28 on Dec. 13) throughout their lineup, so it was good for our young guys to get the mat time," Dennis said. "And it's good to face difficult teams like this." 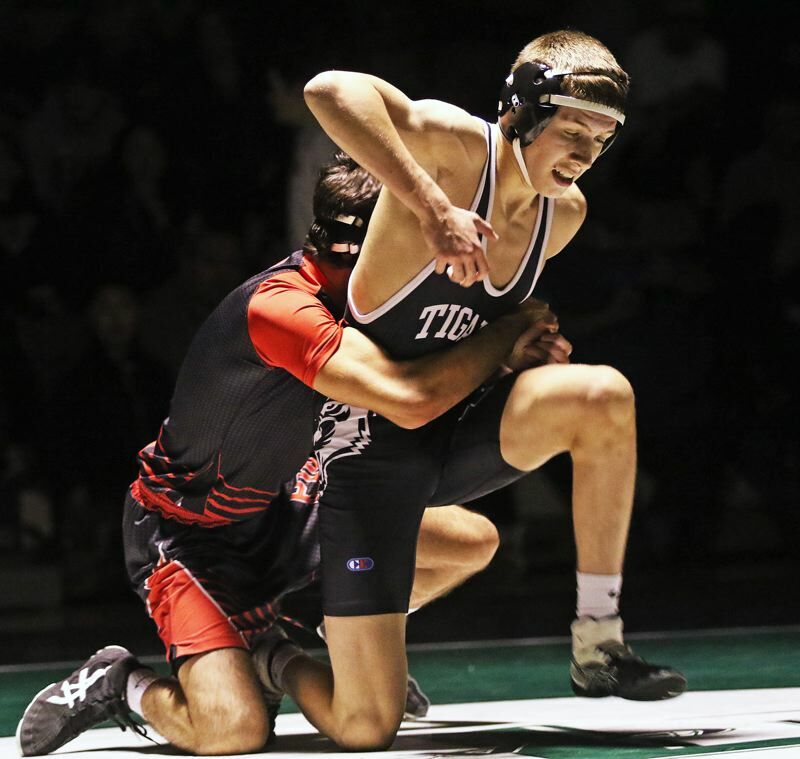 Dennis, who earned a spot at the Class 6A state tournament two years ago as a Tiger sophomore, before missing his junior year due to injury, had to battle back from behind in his match against Oregon City's Henry Schoenfeld on Thursday. Schoenfeld, with a first-round takedown and a second-round escape, took a 3-1 lead into the third round of the 220-pound match. But Dennis came storming back, opening the final round with an escape, and then getting a takedown of his own, giving him a 4-3 lead with 1 minute and 5 seconds left in the match. Dennis then pinned Schoenfeld at the 5:17 mark of the match to get the victory. "I knew that he was a tough kid, going into it," Dennis said. "I think I'd wrestled him before, my sophomore year, and he was tough then. I knew that I was down, but I had to keep the pace up, and keep pushing the match. What got me the pin was he was reaching back and I was able to get the half in, and turn him onto his back." The win very well could be a good sign for Dennis' senior season, and his inspired return to action. "It's motivation, because I feel like I missed out on an entire year of things I wish I could have accomplished," he said. "I'm not really 'back with a vengeance,' but I'm back to be able to get in the work I wasn't able to." Jimenez wasted little time in his 138-pound match against Oregon City's Refugio Morales Ayala. Jimenez took a 2-0 lead with a takedown coming 46 seconds into the bout. He then pinned Ayala at the 1:27 mark. "I thought I would have (Oregon City standout) Spencer Townsend, but I guess he's out right now, so I just had to prepare for my match," Jimenez said. "It went pretty well. I wasn't trying to take it easy. I kept going hard and wanted to set the pace." Jimenez is also looking to set the pace for the rest of his senior season. "I want to be a district champion and a state champion," he said. "This is my year. It's going to take hard work and dedication." Freshman Atticus Waddell got the Tigers off to a strong start in the match with the Pioneers, as he pinned Oregon City's Oscar Cuellar in 3:14 in the 106-pound match. Tigard junior Zack Vorvick, at 132, scored a 7-4 decision win over Jorge Bagos. Vorvick trailed 4-3 going into the third round of that match before rallying to get the victory. He got a key takedown with 45 seconds left in the bout. Tigard's other win came at 113 pounds, where junior Cameron O'Connor got a forfeit victory. The Tigers will be back in action when they compete at the Pacific Coast Wrestling Championships, which will be held Dec. 28-29 at Mountain View High School in Vancouver, Wash.